In Maxwell’s triangle, we have seen that three slightly darker primary colours are located opposite three brighter colours which are reached by moving from each corner through the white centre point. Green-blue (or cyan) lies opposite the red corner, with purple (or magenta) opposite green and yellow opposite blue. 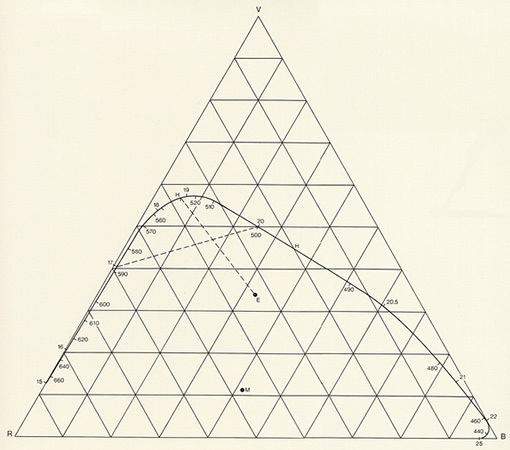 If we then wish to create a spacial colour-system from this more explanatory triangle, we can do so in a similar way to the English architect William Benson. In 1868, Benson proposed the first of his many colour-cubes. 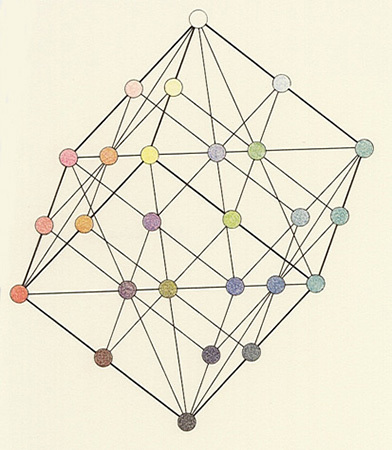 He considered this arrangement to be the «natural system of colours», as the title of Chapter 7 of his «Principles of the Science of Colour» states. At the outset, Benson cited the preliminary work of Mayer, Runge and Chevreul, but then proceeds in long sentences to justify his own preference for an alternative geometry. «In order to use the normal methods of geometrical representation of all combinations which can be formed from three independent variables, a point must be chosen which represents zero or black — the absence of all light. From this point, three lines must be drawn at right angles to each other. Along these lines, and on all parallel coordinates, the colours red, green and blue shall increase in intensity, commencing at zero. The intensities of red, green and blue, which collectively give white, shall be the same, and are therefore represented by equal distancing along the three right-angled coordinates. The end points of these three lines will thus be the places for the full red, the full green and the full blue, while the lines themselves contain the shades of these three colours towards black… The corner of the cube opposite the black would be the full white, and the corners lying opposite red, green and blue would be sea-green, pink and yellow. The central point would be a medium grey.» The fact that pink is given priority over purple is probably connected with its brightness. 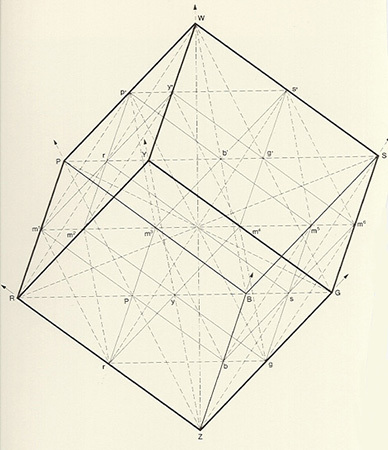 Benson’s cube contains 13 main axes which he divides into three groups (in order to differentiate between contrasts, shades and harmonies). There are three axes connecting the central points of opposing sides and, because only one of the primary colours changes on them, these are termed primary axes. In the figure they are shown as solid lines (together with the lines parallel to them). There are a further six axes connecting the middle points of opposing edges. By following these, two primary colours will change, and for this reason Benson talks of secondary axes. Both they and their corresponding parallels are shown by broken lines. Finally, the four axes which join opposing corners are named tertiary axes, since in this case all three primary colours will change. These are also shown with broken lines. Benson gave exact colour names to all the many points, but we shall only sample them along the line from m1 to m6: m1 is pink; m2 is yellow-red; m3 is pink-blue; m4 is yellow-green; m5 is sea-green; and finally, m6 is sea-green-green. We can pass back and forth through this cube along many routes. It can also be divided into many levels. To illustrate the potential diversity of colours in the cube, we have plotted a few main positions (middle drawing). The column to the outer right represents various horizontal projections which are obtained when passing from white to black. The mirror image of the triangles is here a geometrical phenomenon. William Benson’s system attempts to master both additive and subjective colour mixtures. As a colour-system, a cube will always be confronted with one basic problem: it does not fully allow for the significance of brightness, and therefore places the colour hues wrongly. Benson’s system appears to the eye of the critical observer more as a confusion of colours. If, however, we are not required to use the cube with all the complicated descriptions on its edges and the many straight lines inside, and if we find Benson’s approach acceptable, we will still find our own pleasure in it. Date: The architect William Benson published his cuboid system in 1868, in London. Bibliography: W. Benson, «Principles of the Science of Colour, Consisely Stated To Aid and Promote Their Useful Application in the Decorative Art», London 1868; «Color Documents: A Presentational Theory», organised by S. Wurmfeld, Hunter College Art Gallery, New York 1985.